Arrow Max Compressor & Vacuum Pump is a Bay Area compressed air specialist, serving the screen printing industry. We have helped screen printers all over the Bay Area select, install and maintain the compressed air systems required for powering their business. When these systems have problems or even fail to operate, Arrow Max understands that business stops. If your existing air compressor for screen printing is having issues, or if you are thinking of purchasing a new system, call Arrow Max first for the best price and service. We work on all makes and models, and service screen printers in the greater Bay Area, including, San Francisco, Berkeley, Oakland, Emeryville, Richmond, San Jose, and more. To schedule repair or learn more about working with Arrow Max to service the air compressor for your print shop, please call 510.828.7555 or contact us today. Selecting the right compressor starts with your needs and plans for growth. Consider the CFM requirements of all of the presses you plan to run and any other machines. The next question is, reciprocating or rotary screw compressor, and we can help you select the right applications for your needs and budget. Atlas Copco’s oil-injected rotary screw compressors are leader in the market thanks to outstanding performance and flexible operation. This results in the highest productivity while minimizing the total cost of ownership. GA compressors are built to perform even in the harshest environments; these products will keep your production running smoothly. GX compressors are the powerful and reliable industrial screw compressors for small and medium sized industries. 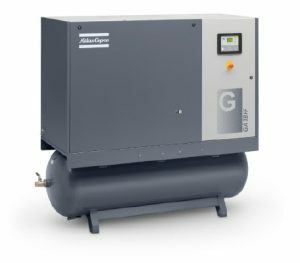 The GX compressors are available in various versions (floor mounted, tank mounted, with or without integrated dryer) to provide flexibility. Built from high-quality components and materials, they provide a reliable source of high-quality air in temperatures up to 46°C/115°F. Call Arrow Max today at 510.828.7555 or contact us today to discuss air compressor sales, maintenance and repair for the screen printing and silk screening industry.